We hit The Wall. It happens to us in the Nineties--that is, we begin noticing during our 90th dive or so. Body parts ache. We think it has to do with the fact that our 90s dives usually coincide with the full moon and the accompanying strong currents. Carrying bulky cameras and bulky bodies to the Turtle House pulls at arms and legs... especially the knees. Sometime after a hundred dives, we get our Second Wind and the aches work themselves loose. At least, that’s how we're reassuring ourselves this week. Meanwhile, the rewards for straining ourselves silly are pretty meager. On the fiercest current days, few turtles show up. Those that do remain anchored to the ocean bottom, large flippers clutching coral mounds for stability. They try to do as little as possible. This makes documenting interesting behaviour rather difficult. 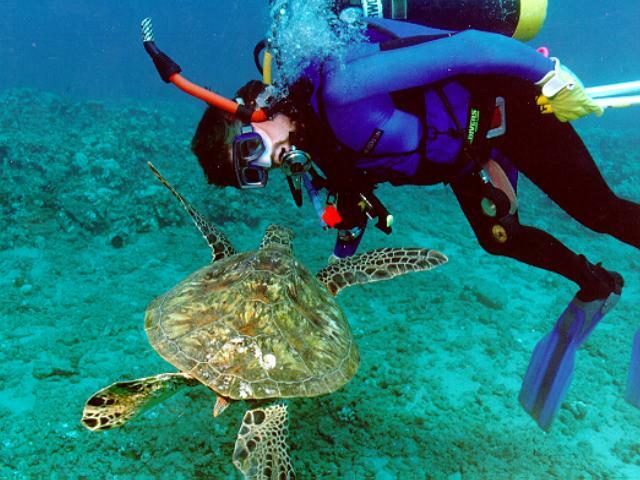 Turtles watch as we strain and puff to maneuver in such current. Apparently, they're smarter than we are. While we've documented a couple of new turtles this week, mostly we saw the same old faces. What we've found interesting is to compare the regulars of the Turtle House versus those at the lesser Reef 2 House downcurrent. Some turtles, like Kaula and Gotcha and Zeus clearly spend most of the day at Reef 2, and only visit the Turtle House occasionally. Other turtles, like Zaphod, are daily fixtures at the Turtle House and are never seen at Reef 2. 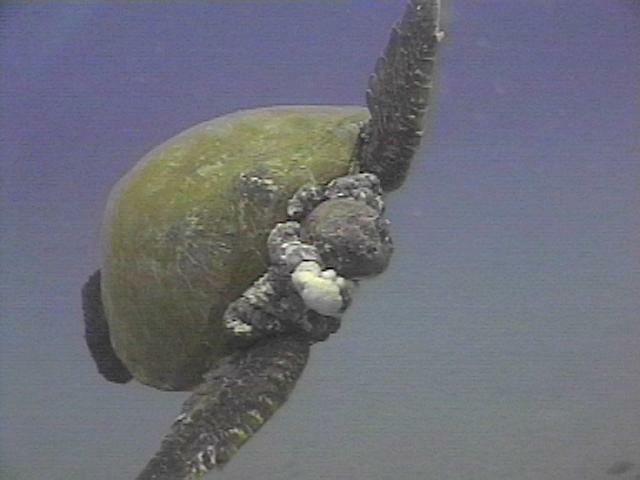 Likewise, some Reef 2 turtles never show up at the Turtle House. What really intrigues us is that the Reef 2 turtles are much healthier than the turtles who show regularly at the Turtle House--just four or five diver minutes to the north. This summer we have documented improvement in tumors on several turtles and we have been encouraged by this. While regression is rare, it does offer hope for the lucky turtles whose immune systems or circumstance helps them grapple successfully with the disease. Tumors often obscure an animal's profile. What's in store for Nibblets? A "recruit" is the youngest turtle you are likely to see that isn't a hatchling. Hatchlings swim out to sea and remain there for an undetermined time called the Lost Year(s), and when they return inshore they adopt a home range. We don't see large numbers of recruits (at most four in a year), and when we do, we always have mixed feelings. Nibblets is one of the newest and cutest recruits. Nibblets is one of the newest and cutest recruits that we see on our dives. We called this turtle Nibblets because on our first meeting, she tried nibbling everything in sight--including us! While we love to see Nibblets and she makes a great subject for photos and video, we fear for her. So far, Nibblets shows no sign of fibropapillomatosis, but we know that if she settles in this area, her chances of escaping are slim. Even worse for Nibblets is the way the severity of the tumors seems to be highest for the youngest. It makes you wonder whether you really want to see such a beautiful little animal next year.